Jason with some cool info about the Florida Project for today’s did you know! When Walt Disney was purchasing land for Project X, other wise known as the Florida Project he made fake companies to buy up the land. These companies are immortalized as company names on businesses down Main Street USA. Each of the businesses were chaired by a business man named Mr. M. Mouse! 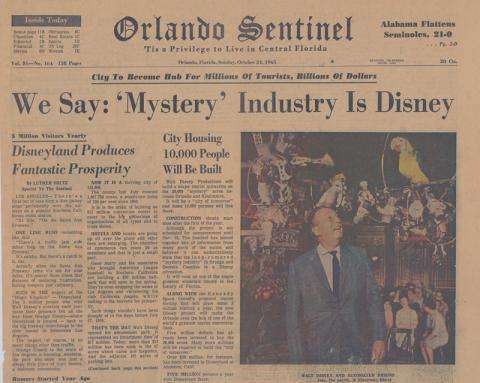 When Walt Started buying land for the Florida Project (Walt Disney World) he purchased the land for as little as 180 dollars an acre until the Orlando newspaper broke a story that Walt was buying land for another theme park. When the story broke land prices jumped to 1,000 an acre. The last piece of land bought for Disney World cost Walt 80,000 dollars! Cool huh? Next Post Diagon Alley Officially Open!